June 10, 2014, 11:30 a.m.
@alexismadrigal Holy hell, that's easy. @jkottke Good, right?! I saw @jbenton do it and was like: that is some really nice action. It’s not perfect. The special interface won’t appear in non-official Twitter apps (like Tweetbot, which I use), and if you’re not logged in, it falls back to a link to your own standard subscribe page. But it’s a good enough tool that I’m surprised more publishers — particularly those with big Twitter followings — aren’t using it. One reason publishers aren’t using Lead Generation Cards as much as they might is that it’s a little confusing. You need to have a Twitter Ads account to build a Lead Generation Card — but you don’t need to actually buy an ad. @alexismadrigal Nope. You set it up via Twitter Ads, but no credit card needed. We’re probably something of an edge case, since we have lots of Twitter followers (about 157,000) and fewer email subscribers (about 16,500). But I think a lot of publishers could bump up their email subscribers with this tool. When I saw the email addresses of our new subscribers, I realized that we hadn’t done a particularly good job of cross-promoting our email to our Twitter followers; many of them probably didn’t even realize we had a daily email. I bet there’s some engagement gold to be mined in improving that cross-platform connection. Benton, Joshua. "Convert your Twitter followers to email subscribers with a Twitter Lead Generation Card." Nieman Journalism Lab. Nieman Foundation for Journalism at Harvard, 10 Jun. 2014. Web. 19 Apr. 2019. Benton, Joshua. "Convert your Twitter followers to email subscribers with a Twitter Lead Generation Card." Nieman Journalism Lab. Last modified June 10, 2014. 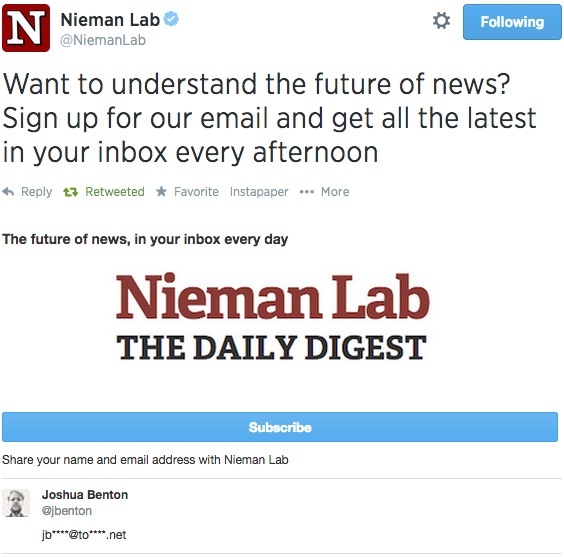 Accessed April 19, 2019. https://www.niemanlab.org/2014/06/convert-your-twitter-followers-to-email-subscribers-with-a-twitter-lead-generation-card/.